President George H.W. 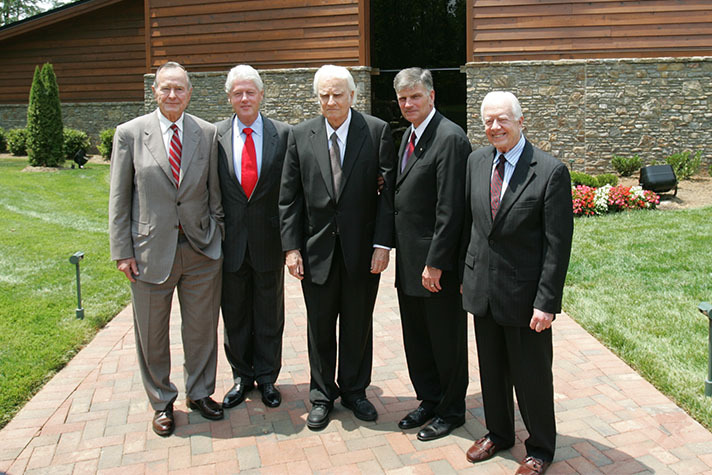 Bush, President Bill Clinton, Billy Graham, Franklin Graham and President Jimmy Carter all came together for the dedication of the Billy Graham Library in 2007. During his lifetime, Billy Graham met with 13 U.S. presidents. Commonly known as the “pastor to presidents,” many of the nation’s leaders looked to him for spiritual guidance and prayer, and thought of him as a good friend. Several have shared personal stories of their time with him. Since his passing, numerous presidents have expressed their condolences. Billy Graham was a humble servant who prayed for so many—and who, with wisdom and grace, gave hope and guidance to generations of Americans. A great man, a humble servant, and a shepherd to millions has passed on. Billy Graham was a consequential leader. He had a powerful, captivating presence and a keen mind. He was full of kindness and grace. His love for Christ and his gentle soul helped open hearts to the Word, including mine. Laura and I are thankful for the life of Billy Graham, and we send our heartfelt condolences to the Graham family. Billy Graham was America’s pastor. His faith in Christ and his totally honest evangelical spirit inspired people across the country and around the world. I think Billy touched the hearts of not only Christians, but people of all faiths, because he was such a good man. I was privileged to have him as a personal friend…He was a mentor to several of my children, including the former president of the United States. We will miss our good friend forever. Rosalynn and I are deeply saddened to learn of the death of the Reverend Billy Graham. Tirelessly spreading a message of fellowship and hope, he shaped the spiritual lives of tens of millions of people worldwide. Broad-minded, forgiving, and humble in his treatment of others, he exemplified the life of Jesus Christ by constantly reaching out for opportunities to serve. He had an enormous influence on my own spiritual life, and I was pleased to count Reverend Graham among my advisers and friends. Share how Billy Graham had an impact on your life.